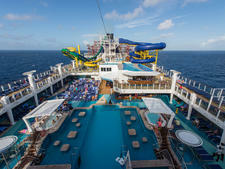 Technology has certainly made traveling easier, and cruising is no exception. Need to get a message to your cruising companion but you're not sure where she is? There's an app for that. Need to quickly convert a price in Japanese yen into dollars? There's an app for that. Need to make an onboard restaurant reservation or check out when cruise trivia is? There's an app for that, too. 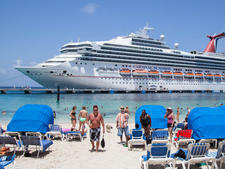 In recent years, cruise lines have introduced a variety of cellphone software applications (commonly referred to as apps) for a variety of pre-cruise and onboard uses. Some of the more popular apps are pre-cruise research tools that allow potential cruisers to view itineraries, learn about ports, explore ship deck plans and flip through photos of the onboard experience. Also prevalent are apps (sometimes it's the same app) that passengers can use onboard to keep track of when onboard activities are taking place; make reservations for things like restaurants, shows and spa treatments; and even track onboard spending. Slightly less widespread are apps that enable onboard passengers to communicate with other passengers at little to no cost, through app-to-app texts and, sometimes, phone calls. This Apple app (only available for iPhone users) presents a series of 360-degree virtual reality destination experiences that highlight both ports and tours of Azamara ships. 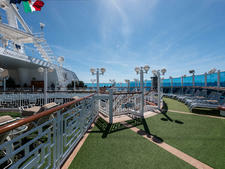 Utilizing the same virtual reality technology behind modern video games, Azamara enhances its brand's destination immersion ethos with sample app experiences like ziplining through a Costa Rican rainforest, sailing the Panama Canal, exploring ancient Athens or taking an evening carriage ride in Cartagena, Colombia. 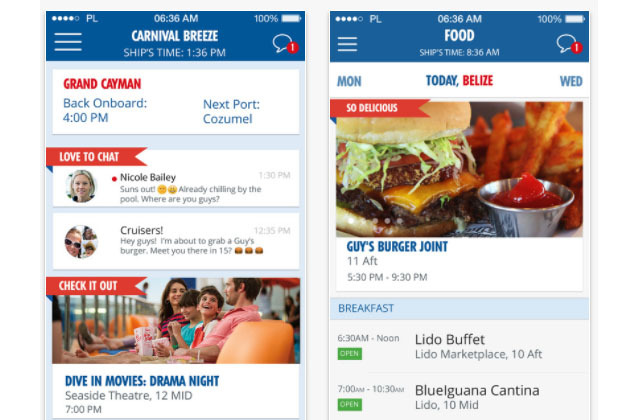 With this app, Carnival cruisers fleetwide can browse the day-by-day schedule of all onboard events, including nightly shows, sporting events on the big screen at the Seaside Theater, Seuss at Sea daily events, poolside activities and more, all the while saving their favorites so they don't skip a beat. Cruisers also can check the real-time balance on their Sail & Sign accounts; find information about alternative dining venues like Guy's Burger Joint, BlueIguana Cantina and Bonsai Sushi (the ability to make reservations is in the works); research and book shore excursions; search deck plans; and keep track of their ship's current estimated arrival and departure times for upcoming ports. For $5 per cruise, app users can turn on a "chat" feature and communicate via text-like messages with other app-enabled passengers onboard their ship. There is also a group feature so multiple members of a family or a group of friends can communicate at the same time. Carnival plans to add more functionality to the app in the future, including the ability to view photos taken by the ship's photographers. Currently only available on Celebrity Constellation, Edge, Equinox and Reflection, this app lets users browse through each day's activities, including movies and theater productions; research shore excursion options; look at all restaurants, bars and lounges onboard, including menus; check out spa services; and consult deck plans to help with getting around their ship. On Celebrity Edge, cruisers can use the app to remotely open their cabin doors, control their room's lights and raise or lower the temperature. Currently only available on Costa Diadema, the Costa Cruises App helps passengers onboard keep all their cruise details at hand, including information on ports of call and weather conditions. For each port of call on the sailing, users can view all the excursions available and book the ones they want without leaving their ship cabin. Cruisers can also make restaurant bookings, check their onboard charges and chat with travel companions (if they're also using the app). Additionally, once at home, cruisers can access their CostaClub status, check their points and privileges and display all their Costa cruises, past and future. Costa plans to roll the Costa Cruises App out to more ships in the near future. This pre-cruise app gives cruisers interested in learning more about Crystal the opportunity to take a virtual reality tour through the line's ships, as well as some of the destinations they visit. While onboard any Crystal Cruises vessel, use this Crystal-customized app to view free movies on your smartphone or tablet, including Hollywood blockbusters, popular oldies and destination-specific short films produced by Crystal Cruises. You can also watch Creative Learning Institute lectures filmed during various Crystal Cruises. Onboard any Crystal ship this app allows you to read 20 national and international newspapers including, but not limited to, Daily Mail, The Guardian, The Australian, Toronto Sun, Boston Herald, Chicago Sun-Times.com, Forbes Daily, Los Angeles Times, New York Daily News, San Francisco Chronicle, The Washington Post, USA Today and The Observer. Digital versions of Crystal's Reflections daily newsletter and shore excursion booklets also are available. The app is free for onboard use, and post-cruise digital newspaper service is available for purchase. Specifically for passengers of Crystal's yacht, Crystal Esprit, this app allows users to view deck plans, restaurant and bar information (including daily menus and specialty cocktails) and a digital version of the daily Reflections newsletter; arrange housekeeping; check flight statuses; and access port guides and maps. Before your sailing, use this app to set your "Countdown to Your Cruise" clock. During the cruise, use it to find character experience times; check out the daily list of onboard activities and entertainment (and build a personalized list of favorites); review dinner menus; read up on destination details; and look at ship maps and maps of Castaway Cay (the line's private Bahamian isle). You can bookmark favorites for easy reference. 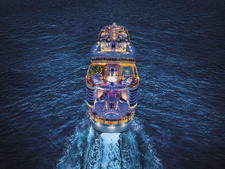 It also allows travelers to send free text messages to other people on the same ship via its onboard chat feature. (The app has specialized Disney emojis for use on the ship!) 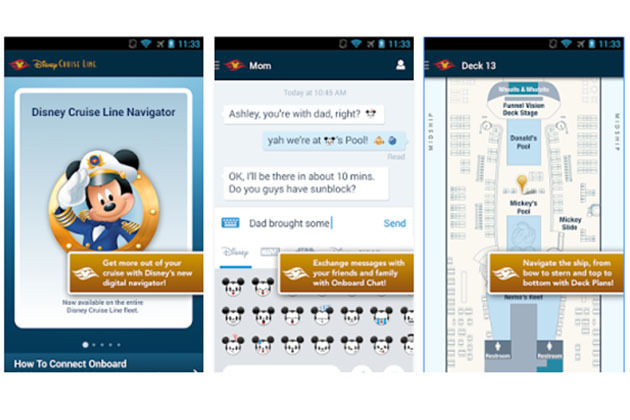 The app's free to use and is available on all four Disney ships. A free website that functions as an onboard app only when onboard a Holland America ship, Navigator is compatible with smartphones, tablets and laptops and helps passengers make the most of their cruise vacation. Book shore excursions, review restaurant menus and make dining reservations, scroll through onboard events and activities, chat with other passengers using the site, scan spa treatments and check onboard account balances. There's no download or internet package required. Navigator simply opens automatically upon connecting with any ship's Wi-Fi; it's available fleetwide. This pre-cruise app allows would-be cruisers to view cruise itineraries and excursions; find cruise deals and MSC-related news; track the fleet's movement in real time; take a virtual tour of cabins, restaurants, and sun decks; watch a live webcam feed of each ship; receive push notifications for special offers; and tag selected cruises to view later. Not an app in the traditional sense, this is a webpage that offers app-like functionality and works, for free, on any computer, smartphone or tablet connected to the MSC intranet (no internet package purchase required). The app is available in six languages, including English, and you can use it to make restaurant and shore excursion bookings; view sea conditions and port weather forecasts; stay abreast of onboard shop promotions; check out daily activities and special events; highlight preferred activities; and keep up-to-date on global news. You can also friend and chat with other passengers in real time and share photos with other travelers onboard. This website only works on MSC Divina, MSC Magnifica and MSC Preziosa. 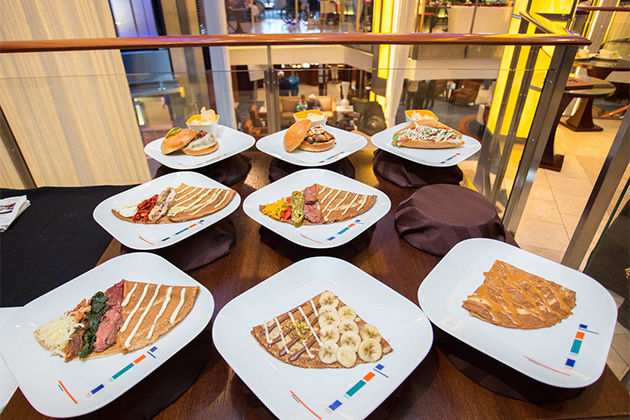 Only available on MSC Meraviglia, MSC Seaside, MSC Seaview and MSC Bellissima, the MSC for Me app features pre-cruise services including web check-in, as well as onboard features that run the gamut from getting around the ship (there's a map that can pinpoint exactly where you are on the ship and provide step-by-step directions) to making bookings for shore excursions, theater shows and specialty dining. You can also find a full listing of each day's activities, events and promotional offers and bookmark the ones you like into your Personal Agenda. Available fleetwide, use this complimentary onboard website app to review your folio/purchases; check the day's events and activities; find ship venue locations and opening hours; review port guides and the ship's itinerary; and browse restaurant menus. Using the free Messenger portion of the Princess@Sea app, passengers can send text messages to other people traveling on the same ship who are also using Princess@Sea Messenger. This anytime, anywhere app allows users to search for cruise itineraries by destination, ship and port of call; browse stateroom photos and watch ship videos; watch destination videos; and browse shore excursion samples. Available fleetwide, this app has lots of functionality. Check your personalized daily schedule, as well the Viking Daily; get weather forecasts and port information; book shore excursions, spa appointments and dinner reservations -- and get reminders; use deck plans and port maps to help you navigate on the ship as well as in port; and take advantage of the embedded Viking Art Guide to explore hundreds of pieces of artwork on your specific Viking ship.